It is so easy to get side tracked and say to yourself "Oh I can do that tomorrow". Or "It won't matter it will never be noticed" When this happens it seems innocent enough. However, it takes but a nano second for the enemy to slip in ever so subtly. This is what we need to be very aware of. For example if you begin your day with prayer everyday and you make the decision to miss a few days, that is all the more for that hedge of protection to be lowered. Think of it this way. God never takes a break. He is with us all the time everyday. We should do the same. Rejoice in him (God) Greatly everyday. 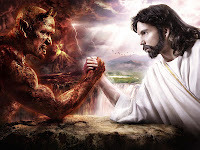 Ephesians 6:12 For our struggle is not against flesh and blood, but against the rulers, against the authorities, against the powers of this dark world and against the spiritual forces of evil in the heavenly realms.